Governor fails to reveal how state will make up her budget's $2 billion deficit at the Monday gathering. Oregon Gov. Kate Brown did not directly address the biggest question facing her administration when she appeared at the 2018 Oregon Leadership Summit on Monday morning — how she wants the 2019 Oregon Legislature to raise the additional $2 billion needed to balance the proposed budget she released last week. Instead, Brown talked in general terms about the need for "more investments" in issues she prioritized in her proposed budget, including education, health care and climate action. 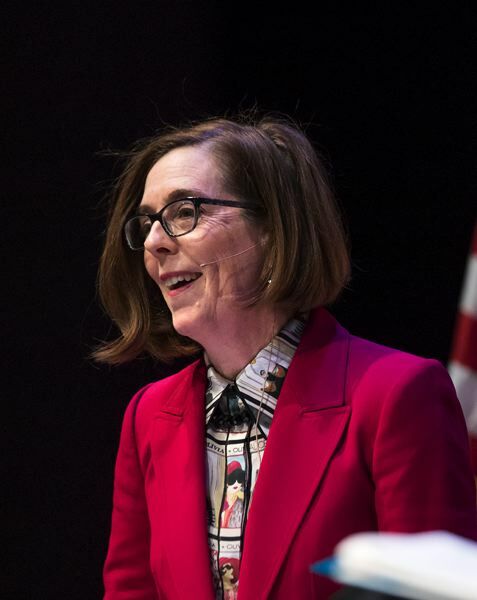 "Oregon is at a turning point," Brown said, noting that the state's current strong economy "gives us opportunities to make those investments now." The lack of specifics was surprising because the three business organizations that sponsored the summit had all but proposed a deal on Brown's proposed budget. The Oregon Business Council, Oregon Business and Industry, and the Portland Business Alliance had drafted the 2018 Oregon Business Plan at the center of the summit. The most recent version of its annual proposed state business blueprint, it looks favorably at the Legislature diverting state "kicker" tax refunds into a reserve fund and enacting a "business activities tax" on corporate revenues, minus purchases from other firms. But, the plan said, such revenue increases will do little good unless the Legislature also curtails projected Public Employees Retirement System premium increases that will consume much of them. According to the plan, the PERS burden is expected to double over the next four years. At first glance, Brown and her party would seem to have a mandate to do whatever they want at the session that begins on Jan. 22. She beat Republican state Rep. Knute Buehler by 50 to 44 percent at the Nov. 6 general election. And Democrats won three-fifths "supermajorities" in both the Oregon House and State Senate at the election, giving it the authority to raise taxes without the support of any Republicans. But approving such an increase without any Republican support is politically risky. House Republican Leader Carl Wilson (R-Grants Pass) has already signaled he's prepared to make a campaign issue out of it. The issue broke wide open several hours after Brown finished talking, however. During a panel discussion on future education spending, four Oregon legislators directly confronted the $2 million deficit and the political difficulty of increasing taxes that much if government costs — including increasing Public Employee Retirement System premiums — are not also controlled. "It's got to be bipartisan and got to have substantive cost containment," state Sen. Tim Knopp (R-Bend) said of any effort by the next session to raise that much money. Wilson went even further, saying that rural Oregonians don't understand why the state needs that much more money because it is already collecting a record amount of taxes. Despite the call for "cost containment" in the plan, the business leaders at the summit found much to like in Brown's proposed budget. Like all 15 previous plans, the 2018 version called for more state spending on education, lamenting the property tax limitations imposed on schools by the state voters when they approved Measure 5 and Measure 50 many years ago. Brown made her comments during a panel discussion titled "Executives Working Together to Solve Oregon's Biggest Challenges." The other panelists, who she chose, were: Maria Pope, president and CEO, Portland General Electric; Lisa Vance, EVP, chief executive, Providence Health and Services; and Julia Brim-Edwards, senior director, Global Operations, World Headquarters, Public Engagement, Government and Public Affairs, Nike. Ironically, in response to a question from Brown, Brim-Edwards was more direct about the business community needing to support the tax increases necessary to fully fund the governor's budget. She invited the business leaders to join a new organization Nike helped form last week called the Coalition for the Common Good that is intended to support the proposed budget at the 2019 Oregon Legislature. You can read the 2018 Oregon Business Plan at: tinyurl.com/ybekpv8e.